Sitting majestically in one of Kota Kinabalu’s busiest districts, facing the South China Sea, neighboured closely between the state’s current shopping obsession IMAGO Mall, modern SOHO property Riverson, KK Times Square, and the uprising Sutera Avenue. 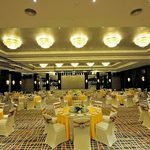 Ming Garden Hotel & Residences is a vibrant 4-star hotel where modernization, conceptual, food, arts and music meet your essential needs. A novelty wing soaring beneath the Land below the Wind, Ming Garden Hotel & Residences charms the heart of travellers and local visitors alike to their warm sanctuary and pleasant hospitality in the pulse of Kota Kinabalu City. Whether traveling for business or pleasure, our hotel is a refreshing mix of technology and glitz uptown living. No matter what inspires you, Ming Garden Hotel & Residences indulges your passion. 2) 2) Extra mattress @ RM85nett per night per bed inclusive of breakfast for 1 person. · Tour Desk for tour arrangement is available at lobby. Hotel room is really nice and comfortable but toilet is a bit dirty, and breakfast buffet selection isn't the greatest. Everything else is very nice! The staff is super friendly, helpful and nice. Just that the hotel is aged. The plates and cutleries are not clean sometimes, oily plates. Good location and the staff are very friendly and accommodating. The rooms are clean but they do allow people to smoke in their rooms which is unusual in this day and age. We had to change our room because of the strong smell of cigarettes. Went for wedding reception. Staff are professional, helpful and friendly. Kudos for that. Parking space capacity leaves a lot to be desired. Basement parking costs RM10 unless ticket was stamped in which case, will get a 50% discount to RM5. Better use transportation services like Grab or taxis if planning to stay here. Beautiful halls in which activities can be conducted. B-6-15, The Loft A, Coastal Road, Imago Shopping Mall, KK Times Square Phase 2, 88100 Kota Kinabalu, Sabah. B-3A-10, The Loft A, Coastal Road, Imago Shopping Mall, KK Times Square Phase 2, 88100 Kota Kinabalu, Sabah. A-2-3A, The Loft A, Coastal Road, Imago Shopping Mall, KK Times Square Phase 2, 88100 Kota Kinabalu, Sabah. E-9-27, The Loft A, Coastal Road, Imago Shopping Mall, KK Times Square Phase 2, 88100 Kota Kinabalu, Sabah.